I’ve been a portable radio fan since I was a kid…way too long ago to be more specific. I always liked being able to carry my radio with me, and this includes shortwave radios. Since some portables are truly excellent I felt I was getting close to the best reception possible without being “tied down” to a fixed listening location with a tabletop receiver and perhaps an external antenna or two. Well things changed. Due to a very lucky situation (an on-line closeout) I suddenly came into possession of a new Grundig Satellit 800. I’d read about this receiver since it appeared and even played with one briefly in a store but never expected to buy one, but now…here it was. Even though I had sat down in front of one before I was again surprised by the size of it. You always read that people are surprised when they see the 800 for the first time. Well, I think the reason is more than just its huge size…it’s the proportion and layout of the display and controls. The LCD display is amazingly large and is easy to read from across the room, even the smaller digits such as AGC, ATT, Bandwidth etc…you can see everything from many feet away. As it happened I had a spot ready for the radio…a side table in my office/den…displacing a Zenith Trans-oceanic…at least temporarily. This spot is good as I listen most while I am working at the desk, plus it’s an isolated spot where I can listen at most hours without bothering others (or being bothered BY others). I put in a set of new alkalines (6 “D” cells please), and did a quick sw band scan comparing it with my trusty Sony 2010, both radios on their batteries and whip antennas. I found that they had some minor differences in the way they handled tough signals. For outright whip sensitivity the 2010 was a bit better. Stations like WWV were generally similar on the two radios but if there was a difference the 2010 usually out-pointed the Satellit 800 by a hair. I wasn’t particularly surprised at this…the 2010 is legendary for whip sensitivity and the Satellit 800 is just a bit less sensitive in this mode (independent published specs support this). As I scanned up and down the bands though, I noticed occasions where stations seemed better on the 800 than on the 2010. It seemed that there was just less hash surrounding them on the Grundig, and I finally realized that this was occurring when a weak station was adjacent to a stronger one. This was actually a revelation. The two radios seemed to separate the signal well enough against the stronger adjacent or alternate frequency, but the recovered audio was clearer and easier to understand on the Satellit. My intuition tells me this is the result of the 800′s excellent blocking and ultimate rejection specs…the adjacent signal is causing less hash to interfere with the desired signal. I have verified that this seems to occur frequently when signals are stronger in the evening and with external antennas, and it is one reason I now find it worthwhile to “Sit in front of the Satellit” when I’m listening seriously. One other side note is that when scanning I tended to identify and stop on more stations on the Grundig than on the Sony, as the Sony’s wide filter tended to mask some weaker signals adjacent to stronger ones. When I noticed the existence of the station on the Grundig, I could then find it on the Sony, and usually receive it well, either using the Narrow filter or the sync to lock onto the non-interfered sideband. AM was a slightly different story. Here the Sony 2010 outperformed the Grundig using their built-in AM antennas. The Sony just had higher apparent sensitivity and brought in weak signals somewhat more clearly. It was an obvious difference on any weak daytime signal. The Satellit rates ***1/2 in my AM Mega Shootout article. Another problem is that the Grundig’s size makes it cumbersome, if not impossible, to orient the radio for best AM reception. Also, the internal ferrite rod on the Satellit runs front to back – a change from earlier units which had the rod oriented in the more usual lengthwise position. This means the Satellit 800 will have to be aimed at 90 degrees relative to a radio with a lengthwise ferrite rod. I then wanted to test the two radios with a bit more antenna to see how they compared. Initially I used a 90 foot random wire antenna, and powered each radio with its supplied ac adapter. The Satellit is grounded through it’s 3 prong AC plug which improves its AM signal to noise ratio. Both radios were now receiving much stronger signals, and electrical interference was relatively low on most frequencies. As I expected the Grundig acquitted itself much better in this arrangement. The Sony definitely showed some signs of overload. I used the RF and IF gain controls on the 2010 quite a bit to improve several stations. The Satellit was much happier with this additional antenna. It allowed many stations to come in listenably which I couldn’t separate from the background interference on the 2010. Very weak signals, especially when somewhat near stronger ones came in on the Satellit 800 that just weren’t to be found on the Sony. Clearly the additional antenna did a lot to help the Grundig and not much to help the Sony, verifying the claim that portables are designed to be best on their whips, but a well-designed tabletop can really shine with an external antenna. Since then I have spent many hours band scanning on the Satellit 800 with a Wellbrook ALA-330S antenna and I must say it is a total joy. I find I’m logging many new signals, and with the combination of 3 excellent bandwidths, excellent sync, and two-speed AGC I seem to be able to have enough control so as to improve many signals I hadn’t considered listenable before. SSB also works very well, usually resolving Hams and AFRTS very cleanly and very solidly. I have only briefly checked out the Air Band but can report that each time I have scanned around using the whip antenna I have received many transmissions fairly clearly…I am about 10 miles from an airport. The sound of the (unmodified) 800 is a joy compared with my other SW radios. I think it’s good to point out that this is by shortwave standards… but it doesn’t sound as good as perhaps a GE Superadio on clean AM signals, or a real boom box would on FM. It’s single 4″ speaker is not the best quality nor the largest Grundig could have fit into that massive cabinet, yet for SW and AM listening it beats the heck out of any of my portables. I haven’t tried external stereo speakers with it but would imagine the sound quality to be excellent given the right ones. One curious note that I’ve read about and verified is that the Bass & treble controls are actually flattest when they are both all the way up. I don’t know if this was intentional or not, but it is worth knowing when trying to get the best sound out of it. For most sw and am listening the controls seem to provide a comfortable range of adjustment, and music programs on all bands sound really nice on the Satellit 800. (Again the Speaker Upgrade Improves the Bass & Treble response quite a bit). The three bandwidths seem to be well chosen too. At 6 KHz, 4 Khz and 2.3KHz you have a reasonable selection for just about any signal worth listening to, and coupled with the sync which locks like a vice grip you can go a long way towards making a miserable signal sound decent. The Slow/Fast AGC is not explained well in the Owner’s Manual, but it doesn’t take long to learn how to use it properly. Generally, Fast setting is best for band scanning, and Slow is best for minimizing the effects of a fading signal while you are listening to one station. It is also apparent that my other radios with only one AGC speed are similar to the “Fast” setting, so the second slower setting is an added nicety that further helps to improve the listenability of fading signals on the Satellit 800. One nit I have is with the tuning procedures. First, although I’m not a big fan of auto scanning, this radio doesn’t have any kind of signal seek or scan…no auto tuning. It will auto scan through your presets, but this is much slower than stepping through them with the Up/Down buttons or accessing them directly via the keypad. Second, the Up/Down buttons step in 5 KHz increments on sw, and 9 or 10 KHz on AM, but the tuning knob only tunes in 1KHz steps. I therefore find the tuning knob is used a lot less than the Up/Down buttons; it’s mainly for zeroing in on a station I’ve already found with the buttons. As I mentioned earlier, both the buttons and the knob are variable speed controls, but the effect on the knob is subtle. The analog S-meter is a real joy. When you are making fine adjustments, an analog meter shows finer gradations than a digital meter. Whether or not any radio’s S-meter is perfectly calibrated to the original standard (most aren’t), it is nice to have a quantitative readout of signal strength. It makes for interesting log entry notes, and you can see just how much gain you are getting from an external antenna, or it can help you aim or tune an antenna for best reception or best null. The meter’s range seems good on am and sw…unfortunately it virtually pegs on any FM signal, an annoying trait that has been reported by many. 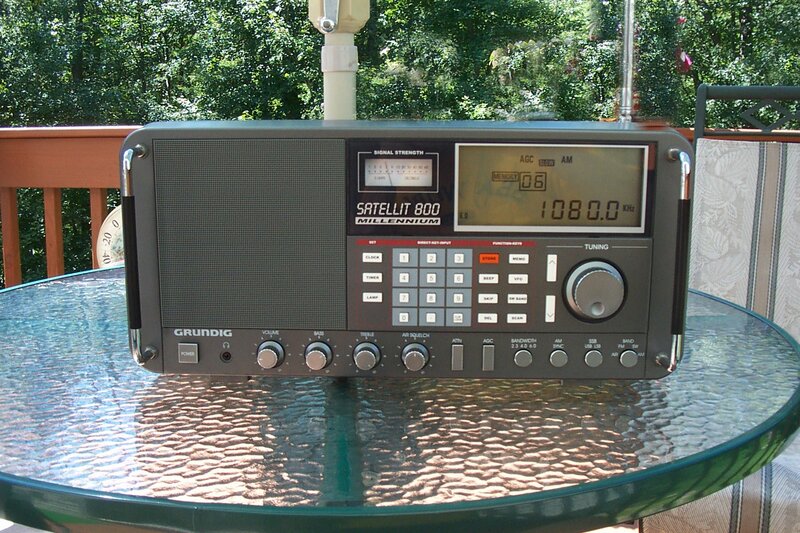 Speaking of external antennas, I have been using the Satellit 800 with several of them…the phenomenal Wellbrook ALA-330S, the random wire I mentioned earlier, a Sony ANLP-1, the C. Crane Twin Coil Ferrite, a Quantum Loop and several passive AM loops. The Grundig likes all of them. The Wellbrook gives the best reception overall with low background noise levels, the random wire gives a good boost in signal level across the board compared with the whip. The ANLP-1, hooked up through the 50 Ohm input helps a bit. The C. Crane Twin Coil Antenna for AM really makes the Grundig shine. Using the inductive coupler it provides whopping gain across the AM band, and it allows aiming for best reception without turning the radio. The combination of the fine tuning on this antenna, as well as the great sideband-selectable sync on the Satellit 800 make a great AM dx-ing combo, and also allows aggressive nulling of local interference, such as from my computer (which of course, I turn off for any serious DX sessions). The passive loops work too but offers less gain and less rotatability than the Twin Coil in this setup. Still, it perks up the radio’s average AM sensitivity quite a bit, and would seem to substantiate the experience of several owners who are happily using the Terk AM Advantage and other loops with their Satellit 800′s. How about the quality control? Shortwave radios undergo a debugging process after their initial introduction which seems more extreme than in most consumer goods these days. It has been documented with many otherwise legendary receivers from Sony to Sangean to Degen to Grundig/Eton/Tecsun et al. Whether it’s their relatively greater complexity or smaller manufacturing quantities I don’t know, but it is common for initial product runs to be flawed with myriad ailments, and the Satellit 800 was no exception. In fact, its initial runs were so buggy with an assortment of woes ranging from wobbly tuning knobs to poor phase response, variable IF rejection and synthesizer-generated hash that the model got a “black eye.” Problems with defective units were so widely reported that Grundig eventually released a collective update; the so- called “Third Generation” with almost as many bug-fixes as a Microsoft Service Pack. It appeared that the big problems were corrected, although it took another year or so before production quality control really settled down. Some unlucky would-be owners suffered through multiple lemons before getting a “good one;” often a hand-tested sample from a reputable dealer. Others availed themselves of R.L. Drake’s excellent Service Department to get their new Satellit 800′s operating to specs. Several others gave up and walked away. The overall build feel is typical of consumer goods these days…it is reasonable, yet plastic quality if you know what I mean. My take is that for what the radio cost when new it offers a lot of performance. Now the radio has stood the test of time… mine is still soldiering along afer many years of frequent use with no problems…indeed it seems more sable then the follow-up E1 which, while also a great peformer, has had QC issues since day one. And what about my long-time friend, the Trans-Oceanic that was moved to make room for the Satellit 800? Well, the 800 wins the spot of honor in the den because, although the T/O has warm, rich sound, is a real aesthetic beauty and a nostalgic home run for me, (and I still use it quite a bit) the Satellit 800 is just so much more radio that I can listen to more on it and navigate around much more quickly. It’s here for the long haul.